NCFA Canada had the pleasure of speaking with the OSC yesterday to schedule a meeting with the OSC staff with the purpose of sharing the results of the National Crowdfunding in Canada survey and have the opportunity to express NCFA Canada's views, on behalf of our membership, in response to the consultation questions posted by the OSC in the Staff Consultation Paper 45-710. During our call we learned that the OSC has announced that they will be extending the public consultation period on potential new capital-raising prospectus exemptions until the March 8, 2013. 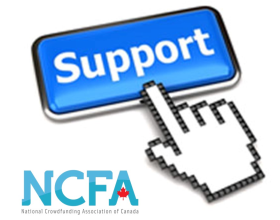 As a result, NCFA Canada together with the Exempt Market Dealers Association of Canada will be extending the National Crowdfunding in Canada survey deadline to ensure we capture as many survey responses and data as possible. We highly encourage all small businesses, investors, industry stakeholders and members of the general public interested in providing feedback on the regulations of equity crowdfunding to participate in the Canadian Crowdfunding Survey. The Ontario Securities Commission announced yesterday that it is extending the consultation period on potential new capital-raising prospectus exemptions. As we've previously discussed, the OSC initiated a consultative process in December with release of a paper on the subject. For more information, see OSC Staff Notice 45-711.